Until tonight I'd never seen MOONRISE (1948), which is No. 8 on a list of all-time great film noir movies compiled by the Film Noir Foundation's Eddie Muller. 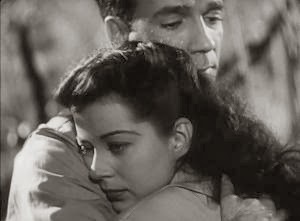 MOONRISE stars Dane Clark and Gail Russell, two actors with the capacity to move me deeply. When I saw the film on the schedule at UCLA as part of the series Archive Treasure: Remembering Charles Hopkins, I knew I had to make the effort to drive up to Los Angeles and see the movie in 35mm, and I'm certainly glad I did. Clark plays Danny Hawkins, who has spent his life living in the shadow of his father having been hanged for killing a doctor -- a background filled in with a fast-moving montage of disturbing images. The film then immediately cuts to a confrontation between Danny and Jerry (Lloyd Bridges) outside a dance; Jerry has taunted Danny for his entire life, and Jerry also happens to be sweet on the girl Danny loves, Gilly (Russell). The two men brawl, and Danny kills Jerry in self-defense, hiding the body in a pond. In the days after Jerry disappears from town, Danny and Gilly's relationship is fraught with uncertainty, yet evolves into deep love. However, Danny is simultaneously tormented with guilt, seemingly on the edge of a nervous breakdown. Will he be able to find a way to confront his past and present problems and have a future? 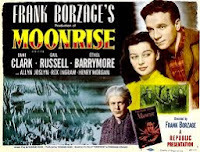 MOONRISE is very dark, both literally and figuratively; many of the scenes take place at night, and the storyline, especially in the early going, is seemingly hopeless, with a great deal of sad and ugly behavior on the part of too many people. For a good portion of the movie I wasn't quite sure whether or not I liked it, yet I loved watching the exquisite images of Clark and Russell blown up on a huge screen. As the film moved along, it swept me under its spell thanks to its haunting images, superb cast, and especially the two leads; when the film came to a conclusion, its beauty left me wiping away tears before the lights came up. 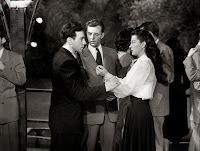 Much of the film's power is due to Clark and Russell, a pair of sensitive actors under the direction of Frank Borzage. 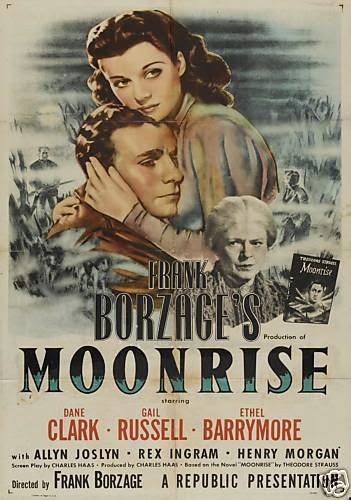 Watching them together is both moving and magical; they're perfect for Borzage's lush romanticism, with their scenes together in an old mansion being particularly spell-binding. There is so much going on -- both in their performances and in the film's striking visual storytelling, filmed by John L. Russell -- that the movie will merit another look simply to take in all the details. Bits of the movie and its swampy atmosphere called to mind later films including GUN CRAZY (1950) and NIGHT OF THE HUNTER (1955); given that this film came first, one has to wonder if it provided some inspiration for the later movies. Lloyd Bridges' bully also inevitably made me think of TRY AND GET ME (1950), a film which made an indelible impression earlier this year; both films involve Bridges with large rocks and murder. Being able to make those kinds of connections added an extra layer of enjoyment to my viewing. This was one of a pair of tear-jerking performances by Clark in 1948, the other being the relatively unknown but very special EMBRACEABLE YOU (1948). Russell, meanwhile, played a deeply troubled woman in that year's NIGHT HAS A THOUSAND EYES (1948). MOONRISE has a raft of outstanding supporting performances, led by Allyn Joslyn as the thoughtful town sheriff. Joslyn surely ranks in my top 5 or 6 favorite character actors, and this is one of his finest roles. He has a scene with Russell where he verbally fences with her, in a very sympathetic way, which was particularly good. Sometimes I think Harry Morgan didn't get enough credit for being a superb actor; here he very believably plays a mentally challenged deaf-mute man, and he's quite heartbreaking in the role. Rex Ingram is also excellent as one of Danny's only friends, who helps gently guide him toward doing the right thing. By the time Ethel Barrymore appeared as Danny's grandmother, I'd almost forgotten having seen her name in the opening credits. She makes the most of her two scenes. The cast also includes actors such as Selena Royle and Harry Carey Jr. in small parts. Phil Brown (STAR WARS) is the town soda jerk, and Irving Bacon the general store owner. Houseley Stevenson, Lila Leeds, Harry Cheshire, David Street, and Charles Lane are also in the cast. The script of this 90-minute film was by Charles F. Haas, based on a novel by Theodore Strauss. 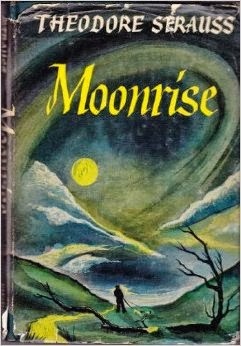 MOONRISE was released on VHS but does not appear to have ever had a DVD release. Criterion has just released another Gail Russell classic, the Paramount film THE UNINVITED (1944), and it strikes me that MOONRISE, a Republic picture, would make an excellent follow-up release. It's a nice idea, in any event. February 2018 Update: Great news, MOONRISE is coming out from the Criterion Collection in May! So glad you got to see this movie, with this pair of attractive talents, in this way. Can imagine how impressive it must look on a big screen, its already such a gorgeous movie even on a poor vhs. Thanks for sharing the experience! Sounds fantastic. I've never seen it. Love the description, and I agree about Joslyn and Harry Morgan, both very, very fine. Such an atypical and charming role for Mr. Joslyn. It's not a film that goes immediately to your heart, but it is impossible to forget. 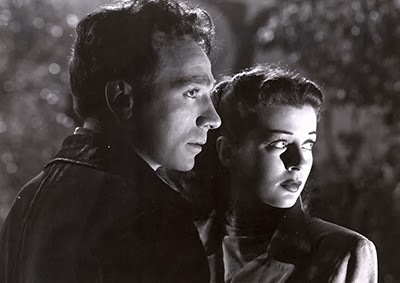 The Self Styled Siren has a a lovely piece about The Uninvited with attention to the Gail Russell. Worth a look as companion piece to this fine article. Barrylane, I agree that the Siren wrote a very good essay on THE UNINVITED, which can be found here. 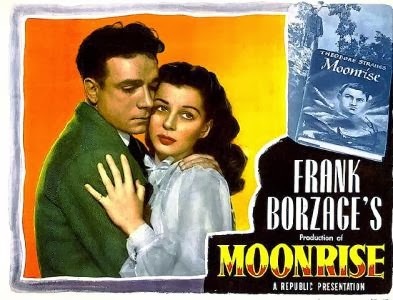 I chatted with her briefly on Twitter this week and we agreed MOONRISE would make a wonderful follow-up release by Criterion. It was also fun to have actress Dana Delany add her praise of MOONRISE in response to our Tweets.